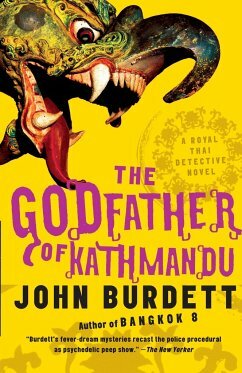 John Burdett's famed Royal Thai detective Sonchai Jitpleecheep is put to the test both as a Buddhist and as a cop as he confronts the most shocking crime of his career. A rich American film director has been murdered. It is an intriguing case, and solving it could lead to a promotion for Sonchai, but, as always, he is far more concerned with the state of his karma than he is with his status in the earthly realm. To complicate matters his boss, Colonel Vikorn, has decided to make Sonchai his consigliere in a heroin smuggling operation. Sonchai travels to Kathmandu to meet Vikorn's connection Tietsin, a Tibetan Buddhist monk, and falls under the sway of this dark and charismatic guru.